My mistakes can be your mile markers in the pursuit of your goals. 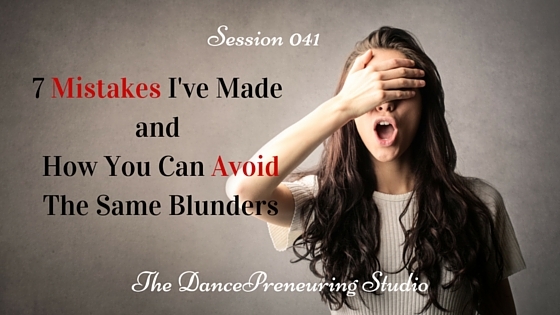 In this session of The Dancepreneuring Studio, I share 7 mistakes I’ve made and how you can avoid the same blunders. Step to Success: Just as steps are necessary in a dance, there are steps to success in your life and business. In this segment, we discuss a step in the form of an app, a book, or a concept that will help you move forward. I’ve spoken in the past about podcasts and other free resources that you can take advantage of to learn and build a business, one of them being the library. This week’s step to success is a resource called Creative Live. These live online workshops are free for anyone to access and cover all types of subjects such as photography, business, music, design and so much more. And if you watch the classes live, you can interact with the instructors in real time. There is no shortage of resources to get creative. Dancer’s Dialect: Today’s word in the dancer’s dialect comes from the House style of dance and it is loose legs, which is a basic step. It’s not that basic to me because of the way the hips have to move as well as the upper body. I love house music and I have taken house dance classes, just not lately so as I was watching this video, I thought, I really need to get back into taking some house classes. As with any style of dance, it’s all the subtleties that make the dance what it is. The feel of house is so important. It’s not robotic or stiff, it’s groovy and free flowing and just feel good. I would say there is a technique to it, not like ballet where it is very defined and rigid, but more of the feeling of it than anything else. In business, next time you read a piece of marketing material, whether it’s a print ad or a commercial, see if you can notice the subtleties and how they make you feel. Freestyle Flow: I remember when I was a teenager in Hawaii and Guam and how much I loved going to the mall. I usually got to go with my family and it was rare that I was allowed to just go and hang out at the mall. The three that we would frequent were Pearl Ridge, Ala Moana, and not really a mall but because we were a military family, the shopping centers on the military bases. I was oblivious to parking, crowds, waiting in line etc. When we moved to Guam, at that time, there were only shopping centers and then when then they built the Micronesia Mall and I finally got to go, as long as my cousin came with me. I don’t know if it was the novelty of the mall as much as it was trying to be independent. Feature Presentation: My hope is that you learn something from 7 of the MANY mistakes that I’ve made, and will continue to make. 1. I didn’t count the cost of a job and how a business would cost me in terms of my health and emotional well-being. Solution: Take some time to think and digest what will be required to take on a new project and trust your instincts. 2. I allowed others to influence my decisions for the sake of keeping up appearances. I’m sure you’ve heard the saying about “Keeping up with the Joneses.” I spent money I didn’t have to impress people that didn’t care. Solution: If the decision doesn’t feel right, don’t do it. And the emotional turmoil that getting into debt and trying to rob Peter to pay Paul costed more than just money. Long term it cost me so much more. 3. I took on projects that I wasn’t passionate about. Solution: I understand that sometimes you have to do things temporarily, however, as soon as possible, get yourself in a position to only do things that you’re passionate about. I would’ve been more intentional about planning an exit strategy instead of wallowing in my circumstances. I spent too much time questioning and not enough time being solution-oriented. Solution: Everyone has their own calling in life and just because it doesn’t fit in with yours doesn’t make them less of a person. Treat others with the same respect that you would expect. It also means you don’t spend extended time with people that aren’t supportive of your dreams and goals. You can love and respect from a distance. 5. I spent way too much emotional energy feeling guilty, tormented and angry for all the wrong decisions I had made because I felt that would change things, like all of that would somehow make up for my mistakes. Solution: Get over it as quickly as possible. Learn the lesson and move on. Forgiving yourself allows you to forgive others. 6. I didn’t put myself in uncomfortable experiences enough. I retreated when I should have immersed myself outside of my comfort zone. Solution: Get out of your comfort zone. For me now, that’s taking dance styles and levels that are uncomfortable for me, like Krump and certain Contemporary and Hip Hop classes. 7. I kept my feelings bottled up inside and didn’t communicate positively. Solution: Find positive ways to communicate and outlets for expression. Dance definitely helps me. What mistake have you made that others can learn from?